This is my currently standing favorite anime. The characters and story are great. now if only I could actually read the novels it's based on my life would be complete. I know a lot of people prefer the older one and say this one is too flashy and actiony for the younger generation, which I can totally see, but as a member of the younger generation I do in fact prefer this one. Either version is great though. Who is the rightful King of Pars and what determines that? I will start off by saying that it only has 2 seasons and the 3rd season is said to come out later in 2018; therefore, I would only recommend watching this now if you just looking for new material. This anime is a must watch! 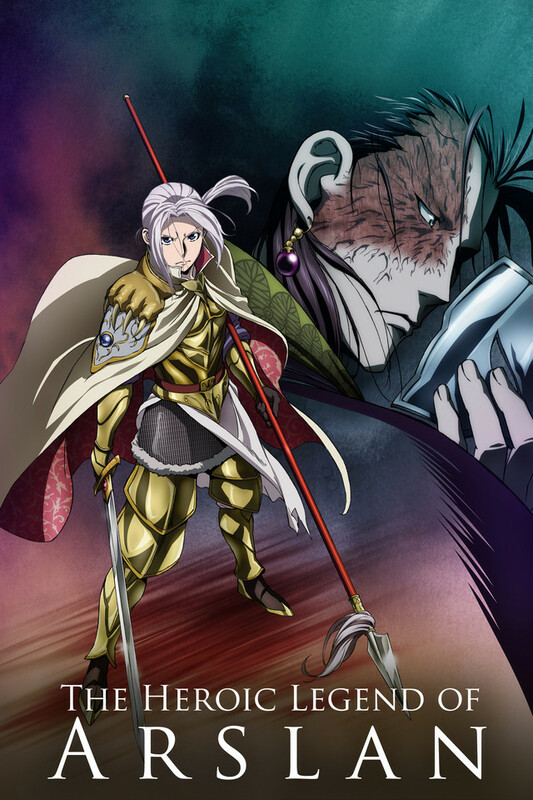 It has the cliché concept of brothers/cousins/family fighting over who gets to sit on the throne, but the story behind how the main character Arslan fights for the throne, is what truly sets this anime apart from the rest. An invading country has invaded the Kingdom of Pars because they believe it is their religious duty to convert everyone to their religion and worship one god, where "all men are equal". This show really tests the loyalty of a kingdoms people to their king and it emphasizes the question: what kind of king do you believe deserves to sit on the throne when all involved parties have a legit claim to the throne? I hope that season 3 will bring a proper ending to this adventurous journey because it was left at a cliffhanger ending for season 2. I can hardly wait!! Season 3 PLEASE!! It has likable characters and an MC that isn't a generic overpowered magical dude with some hidden ability. The Mc matures and becomes a better leader as the anime progresses making a great character development. It also follows strategy and diplomatic struggles instead of your average power gauge anime. It also has a story of its own that fits its theme. Totally different from other animes, but still so amazing! I don't really like long reviews, but just know that this show is so amazing. If you find Kings, knights, dark magic, eras then you are surely to love this. It has a Game of Thrones feel to it but just not as dark lol. You will love all of Arslan's companions and their different personalities jus as much as I do. I also loved watching Arslan grow in the process of his journeys and can't wait for more. I HOPE season 3 comes soon because they can't make me suffer with that ending. Entertaining watch if you have nothing better to see. As you can tell from the title I do enjoy this show, but it could be a lot better than it is. I love the art style as it is drawn by Hiromu Arakawa(FMA, Silver Spoon etc.). The animation is not that great, the background characters and environments sometimes look really offputting and in larger battle scenes there are a lot of horrible 3D CG. The writing, also, is quite bad. The characters seem to have a bad case of plot armor and you rarely feel like there is any danger to the main cast. Same goes for the main villain who seems to always get away no matter what happens. Even having to resort to a magical teleportation which seems really out of place. I won't go into the details about the story as I don't want to spoil anything. It is a decent watch if you don't have anything better. Some of the best animation in a series I've seen with top notch characters. A fantasy-light story that blends together some fantastic characters with some of the best animation I've seen in a series. Each fight and battle feels tense and detailed, with minimal use of speed lines and CG. The characters may seem a bit tropish at first but wind up being fantastic. There is something that feels very genuine about the setting and cultures seen in the show. It reminded me a bit of Game of Thrones, but nowhere near as dark thematically. Definitely an anime which is very easy to get sucked into.